You know what the best time of year is? It's half-off Easter candy time! 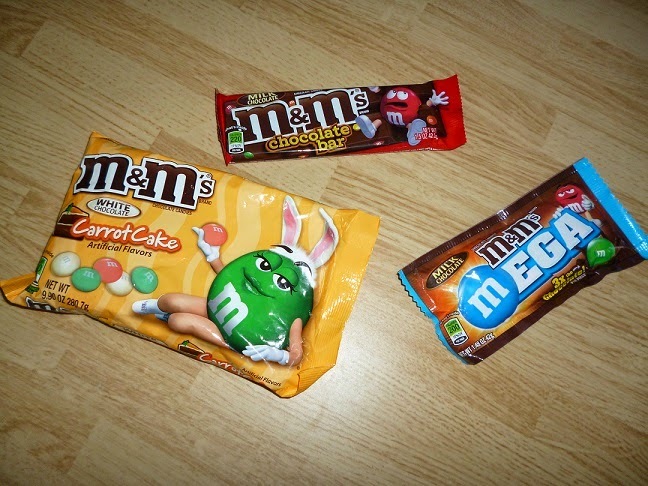 And this year, the M&M's laboratories have been cranking out some interesting things. OK, to be fair, only one of these things is strictly Easter-related (hint: one of them features bunny ears). But they were relatively new to me, so they all got lumped into one post. Let's take a look, first, at the M&M's Chocolate Bar. This one has actually been around for a while--I remember picking one up almost a year ago with the intention of reviewing it but actually just eating it in a moment of weakness. 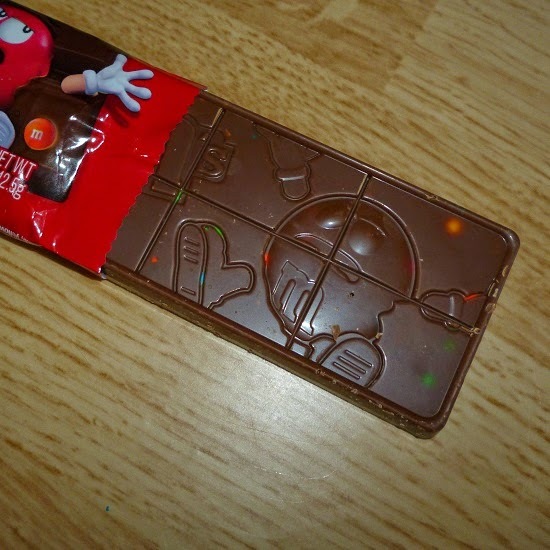 It's actually not bad, although the chocolate they use in the bar is the same as the inside of an M&M. I could see some people liking the small amount of chocolate they get in a piece but not when it's just formed into a rectangle, but it's certainly not bad. The only drawback is that I almost always see this as a "premium" candy bar (i.e., over a dollar) but I wouldn't pay that much for it. It's barely the size of a standard bar, and really it's just a chocolate bar filled with candy coating bits I'm sure they just swept off the conveyor belt. It gets a thumbs up, but only on the half-off table. 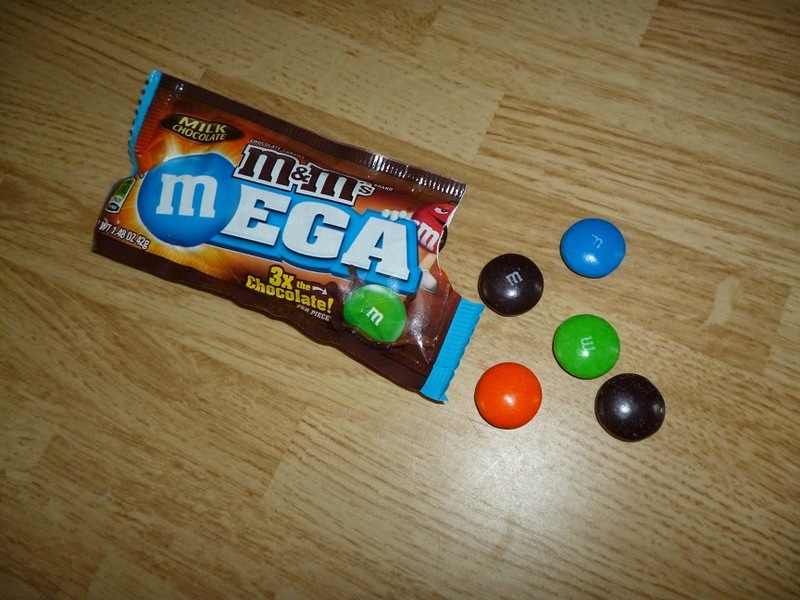 Next up, let's look at the Mega M&Ms. These are HUGE M&Ms that are three times the size of a standard M&M, also known as "about the size of a peanut M&M." What I am about to say is weird, but bear with me: you know when you are eating a handful of peanut M&Ms, and you get one where the peanut escapes, but that's OK because somehow the expectation of getting a peanut and then being denied makes it taste even better? That is not the sensation you get when eating these. They just taste like M&Ms with a different candy-to-chocolate ratio. Eh. 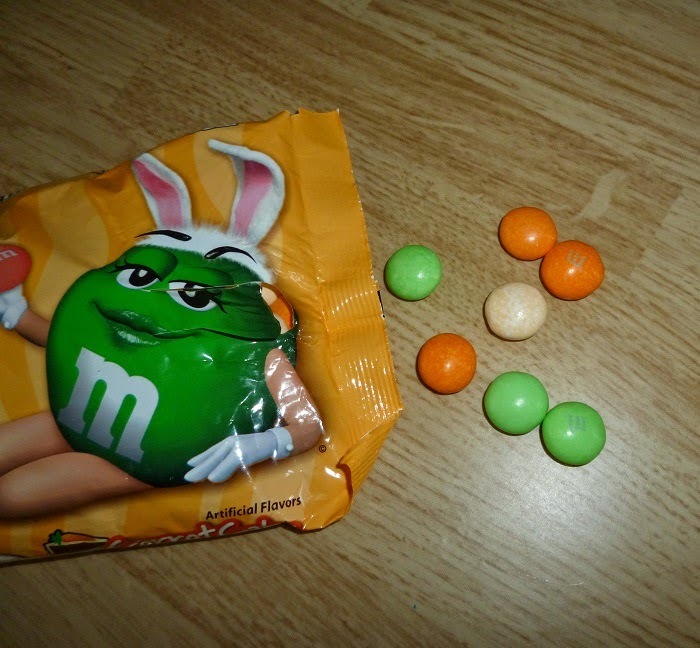 Finally, let's get to the big holiday special: The Carrot Cake M&Ms. They also released some other "Easter" flavors, but they were all standards, like coconut. Now, my opinion about carrot cake is the same as I have for things like pancakes, pro wrestling, and Saturday Night Live--the first bite is awesome, but by the time I'm done with the slice I never, ever want to see it ever again. And so it was with these M&Ms--they do, in fact, taste alarmingly like carrot cake, but they're too sweet and white-chocolatey for me. If you are the sort of person who would actively take carrot cake over any other sort of dessert, I say go for it; otherwise, this is definitely a once-a-year splurge. I appreciate Mars/M&M's effort to diversify their lineup, and like my other reviews have stated, they generally do a good job. I just wasn't overly impressed with the newer stuff.